A brood of ex-battery farm hens have found a new home in Chester after a local primary school decided to build a giant enclosure with the help of a donation from MBNA. 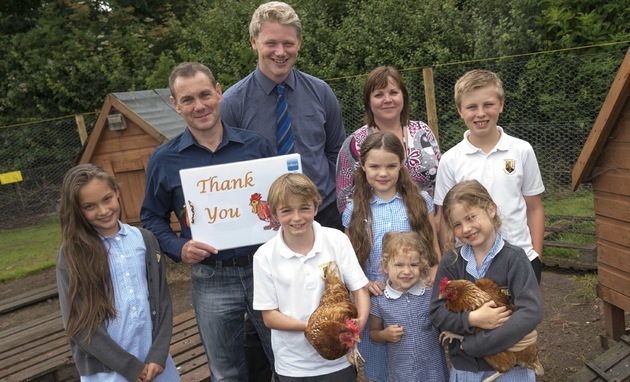 Children at Saighton Church of England Primary School have now adopted six hens after the school used a £2,500 grant from the MBNA Foundation – the Chester-based lender’s charitable giving arm – to buy new equipment and build permanent enclosures on the school grounds. couldn’t part with Henrietta, Starbuck and Betty and used the MBNA grant to make their stay a permanent one and add another three to the group. Robert Boulton from MBNA’s Customer Solutions department applied for the donation on behalf of his nine-year-old son who attends the school. He said: “The hen husbandry project is fantastic and I’m delighted to have been able to help the school in this way. My two sons have both attended Saighton CE Primary and it’s great to give something back through this donation, which should last many years and help the children learn more about how to look after animals. Pupils have already devised their own schedule to care for the hens and make sure the coop is cleaned on a regular basis. Eggs are collected throughout the week and sold to the local community on ‘Free Range Fridays’, with all proceeds being reinvested back into the project to buy food and equipment. Mavis Sellers, Headteacher at Saighton Church of England Primary School, added: "A huge amount of work has gone into the hen project and it has exceeded all of our expectations. It’s been a genuine pleasure to watch the children develop their ecological knowledge; the hens have become an invaluable part of school life and enriched the children’s education. We have achieved the eco-schools green flag award, which recognises schools that embed sustainable and environmental principles into the heart of school life. This grant has contributed to this goal. “On behalf of the school and pupils we want to thank MBNA for its support in helping us provide something that will benefit our children for many years to come."